The idea crystallised in his mind one morning as Sonam Wangchuk was crossing a bridge in the Indian Himalayas. The engineer from Ladakh, in the Jammu region of north India, was already a famous problem solver: a Bollywood film loosely based on his life had grossed a billion rupees in its first four days. 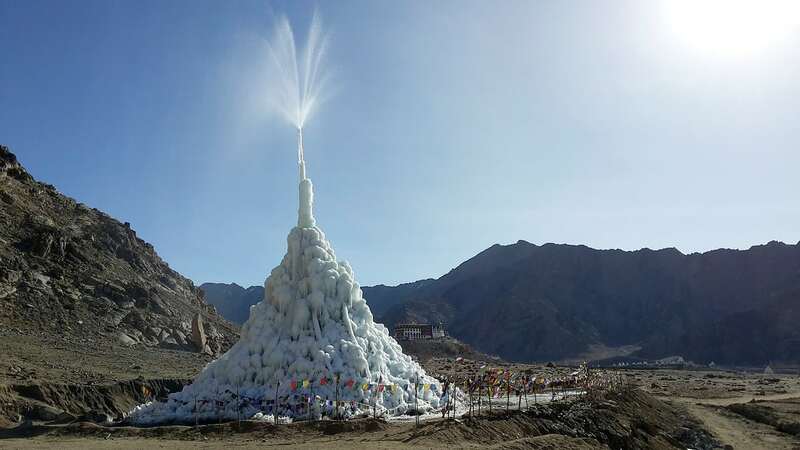 What Wangchuck saw reflected in the ice that day was realised four years ago, when he unveiled his first “ice stupa”, an artificial glacier that towered surreally over the otherwise arid landscape, and for which in December he received a prestigious £80,000 innovation prize. It is the latest solution to an old problem in the Himalayan foothills. Despite its breathtaking scenery, life in Ladakh has always been hard. It is a desert at 10,000 feet, receiving on average just 50mm of rainfall each year. “The only reason people can live there is the glaciers,” Wangchuk says. Each winter, titanic shelves of ice form at high altitudes and melt throughout the spring, flowing downwards into the streams that are the veins of civilisation on the mountain. Lately, that cycle has faltered. Wangchuk is not the first to try to wring a more sustainable water supply from the mountains. For centuries, inhabitants of the Hindu Kush and Karakoram ranges have practiced “glacier grafting”, chipping away at existing ice and pooling the pieces at higher altitudes, hoping to create new glaciers that can supply streams throughout the growing season. Apocryphally, villagers in the 13th century “grew” such glaciers across mountain passes to stop the advance of Genghis Khan. More than a decade ago, another Indian engineer devised an update. Chewang Norphel earned the nickname the “iceman of Ladakh” by using a network of pipes to divert meltwater into artificial lakes on shaded sides of the mountain. The water would freeze at night, creating glaciers that grew each day as new water flowed into the basin. Norphel created 11 reservoirs that supplied water to 10,000 people. “The problem was that it couldn’t be done in lower altitudes, where people actually live,” says Wangchuk. The lakes were also restricted to heavily shaded areas, and simply melted too quickly to make up for the shortfall in water wrought by increasing temperatures. Adapting the concept became Wangchuck’s obsession. The auspicious chunk of ice on the bridge showed him how that could be done. It was a kind of biomimicry: artificial innovation based on natural phenomena, such as velcro – modelled on the way plant burrs attach to dogs, or new skin grafts that stick to bodies by piercing the tissue and expanding, the same way parasitic worms fix to the intestines of their hosts. The conical shape hit a sweet spot, maximising the volume of ice that can be “grown”, while minimising the surface area exposed to direct sunlight. That means it keeps melting well into the spring, releasing up to 5,000 litres of water each day by “storing it in the sky”, Wangchuk says. It also has the benefit of resembling the Buddhist stupas – religious sites used for meditation and worship – that dot the landscape, a crucial point for 50-year-old. “Because it resembles something we have in our tradition, it is made more close to the population, to their hearts,” he says. And the stupas are simple. They are formed by running pipes below the frost line, at which temperature the water hovers between a liquid and solid state. Then the pipes turn skywards, spraying the water into -20C air, using the bitter cold to freeze it as it falls to earth. The first prototype, stretching 20 feet high, was built in October 2013, and expected to melt by the beginning of May. It lasted eighteen days longer. A second much larger stupa was grown near a forest of 5,000 trees, and kept them watered throughout the driest months until 6 July. Those two stupas were funded by crowdsourcing donations. Last year, Wangchuk was awarded a Rolex innovation grant, money he will use to create the next generation of ice towers. 20 more, each 100 feet high, are in the works. He will also use the money to fund an “alternative university” in Ladakh to train young people to see in their surroundings answers to the region’s problems. “Solutions for the mountains, by the mountain people,” he says.